For the next two years, Campbell is home to a professional baseball team. 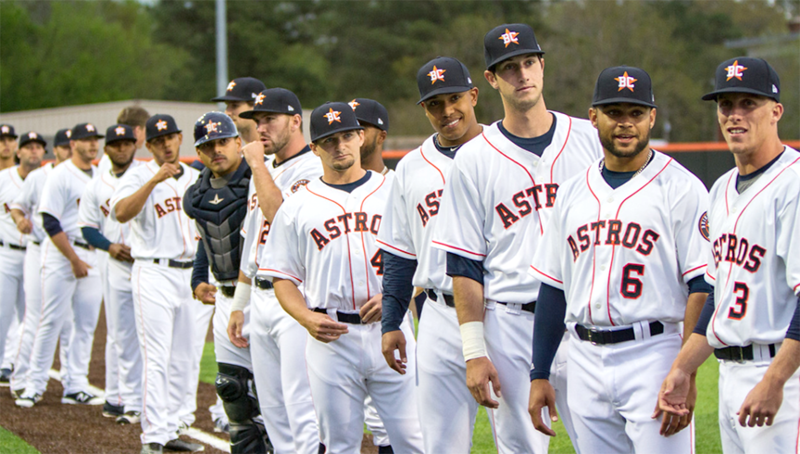 Strange as it sounds, the Astros have found a home in Buies Creek. A lot happens in the on-deck circle. It’s where a hitter takes practice swings before his turn at the plate. It’s where he eyes the pitcher’s mechanics and speed up close — a short window to get his timing down pat. Waiting in the wings before stepping on the main stage, the circle allows him a chance to take in his surroundings and mentally prepare for the spotlight. The Buies Creek Astros are in the on-deck circle. And when they take the field in April 2019 in their brand new, $33 million-dollar stadium in front of 5,000-plus fans, they’ll no longer have Creek in their name. They’ll be the Fayetteville Fatbacks. Or the Fly Traps. Or the Jumpers or Wood Dogs or Woodpeckers. Whatever the name and the accompanying mascot, the team will be the hottest ticket in the Carolina League. They will have stepped up to the plate. By then, the Buies Creek Astros will be a memory. A Wikipedia entry. The answer to a tough baseball trivia question. A rare collectible hat or jersey on Ebay. But that’s 20 months away. For now, these are an important two years for the Houston Astros, an organization that has climbed from the cellar of the American League to the top of the standings. And thanks to its farm system, they look like a team built to stay at the top. These two years are important to this community, too. When it is all said and done, Buies Creek, Campbell University and Jim Perry Stadium will have hosted roughly 130 days and nights of pro baseball in its purest form. Families eating hot dogs and groups of local Little Leaguers chasing foul balls on warm summer evenings. Fans getting an up-close (really up-close) look at future stars like Kyle Tucker, Jason Martin, Forrest Whitley and Franklin Perez. Take it in. Smell the peanuts. There will never be another summer like these two. Even in the world of Minor League Baseball — where rural America, ballparks built near cornfields and intimate, familiar crowds are attributes woven into the fibers of the game — Buies Creek is small. It’s not technically the smallest — it’s actually 12 times larger than Sauget, Illinois (population 250), home of the Gateway Grizzlies of the independent Frontier League. But Sauget is 10 miles from the thriving metropolis of St. Louis, Missouri. The Gateway Arch can be seen from its ballpark. In other words, Buies Creek is no Sauget. The tallest structure seen from its ballpark is Kivett Hall, the centerpiece of Campbell University. You have to drive 40 miles north or south to find anything resembling a city. Buies Creek doesn’t have a stoplight. It’s not even technically a town (it’s a “census-designated place,” by definition). Yet there it was on Nov. 17, 2016, site for the kind of announcement many towns and cities would give their Main Streets for. There stood Reid Ryan — son of Hall of Fame pitching legend Nolan Ryan and president of the Houston Astros — announcing the arrival of professional baseball. A team named for the nation’s prominent space program located in a “place” that covers roughly 2.2 square miles of mostly tobacco fields (and, of course, a university). The scene that November was surreal. Astros executives, local elected officials and Campbell administration donned blue and orange ballcaps and shook hands at home plate in Jim Perry Stadium. Camel cheerleaders unveiled a very Astros-looking logo with “BC” where the big “H” should be. As strange as it looked, it all somehow felt right. Even the weather on that mid-November afternoon felt more like a warm early-season game in May. For an organization that had spent the previous eight seasons in Lancaster, California — a city on the western edge of the Mojave Desert where average highs in the summer range from 95 to 100 degrees — North Carolina was an oasis. Last October, the Astros officially announced it was buying a Minor League franchise in Fayetteville — a move made to help streamline its farm system to control player movement more efficiently (the organization runs Rookie League and Short Season A teams in the east and its Class-A squad in Iowa). Before the purchase, Ryan and David Lane, Buies Creek’s general manager, were scouting cities and towns near Fayetteville to host the team while the new ballpark was being built. Campbell University’s recently renovated Jim Perry Stadium stood out immediately. 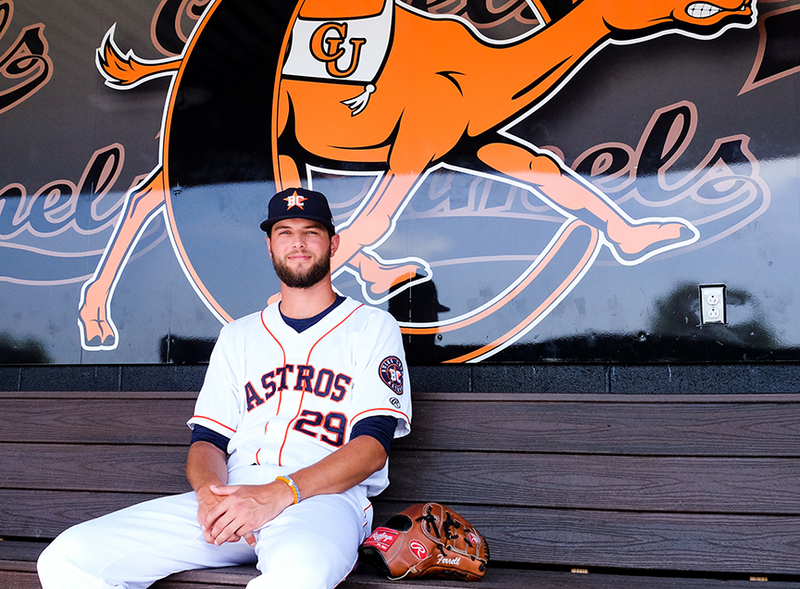 Ryan said part of the negotiating was “finding the best interests Campbell and the Astros.” When the deal was made, Campbell was in the process of adding to its stadium more seating, in-ground dugouts, a viewing deck, new locker rooms and coaches’ offices, and a state-of-the-art scoreboard. What it lacked was a professional-grade playing surface. The Astros fixed that by providing new synthetic turf — a surface that “replicates a natural baseball field’s look and playability” — installed in January. 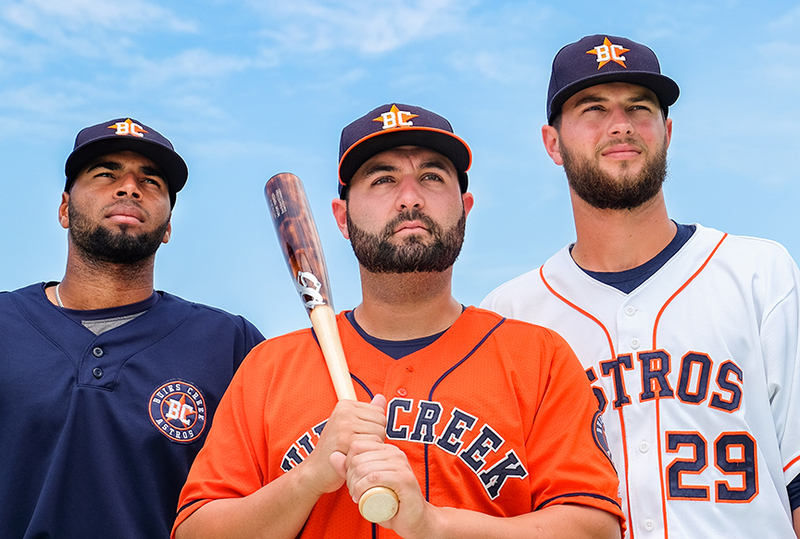 After some creative scheduling to allow for two teams to share one stadium from April to mid-May, the inaugural season of the Buies Creek Astros was set. The excitement from Campbell’s side was palpable. For Campbell President J. Bradley Creed, having the Astros so close was extra special. He grew up a few hours from Houston and attended his first Major League game in the Astrodome as a kid in the 1960s. It’s a 350-step walk from their cramped locker rooms on the lower level of the Pope Convocation Center to the outfield gate at Jim Perry Stadium. The new rubber and artificial grass turf — though ideal when it comes to ground balls, diving and base running — traps heat so that 90-degree day games in June feel about 10 degrees hotter. And there’s only so much Moe’s, Chick-fil-A and Subway a player or coach can eat before they’re longing for more dining-out options. But it could be worse. It could always be worse. Catcher Anthony Hermelyn played Single-A ball last year in Davenport, Iowa, infamous for the smells emanating from the nearby Purina dog food and Oscar Mayer meat production plants both within a mile of the ballpark there. Lancaster, California, where many on the Astros roster played a season ago before the team left for North Carolina, is a desert town. Had the team stayed, they would have experienced a record-breaking 110-degree day in June this year. And for pitchers, Lancaster was a nightmare. When the Lancaster roster learned last year it was heading east, they had a tool better than Google to learn about their new home. They had former Campbell standout pitcher Ryan Thompson, who pitched 20 games for Lancaster in 2016 before being called up to AA Corpus Christi this season. 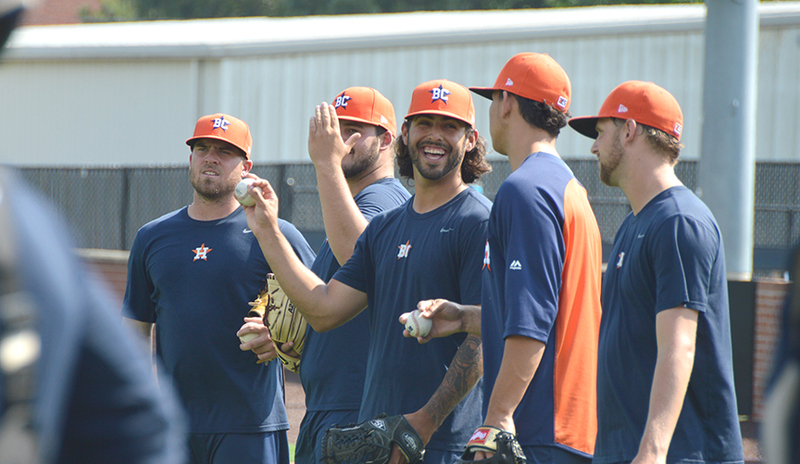 Though it’s small — both the community and the locker rooms — and short on nightlife, Buies Creek has been a welcome change for many on the Astros’ roster. While some on the team have rented apartments closer to Raleigh in towns like Fuquay-Varina or Garner, the majority live a baseball’s throw from the stadium or a few miles out in Lillington. Off days in the middle of a homestand are few and far between in a 140-game schedule, but on those rare occasions, the players have golfed at Keith Hills, tried out tubing on the Cape Fear and have made short group trips to Sunni Sky’s Ice Cream in Angier. It’s the ideal situation for head coach Omar Lopez, a former Minor League player and scout who’s been a manager in the Astros’ farm system since 2008. And focus they do. When they reach the Minor Leagues, players eat, breathe and sleep baseball. From April 6 to Sept. 4 of this year, the team had exactly 12 scheduled off days, three of those in a row for the All-Star break in late June. Because of scheduling conflicts with the Camels in the spring, Buies Creek agreed to play only 62 home games (instead of 70) and 78 on the road. That meant a few more bus trips and hotel stays. But even when they’re home, there’s little time to relax. Players arrive at the convocation center around 1 p.m. on most days, earlier if they need time in the trainer’s room. At 1:30, they’re meeting with specialty coaches (pitchers and catchers in one room, infielders in another, outfielders in another), and around 2:30, they’re heading to the field for about two hours of practice — speedsters practicing their bunts, catchers running down popups and pitchers working on their windups. At 4, batting practice. By 4:15, the visiting team starts entering through the outside gate (after a similar 350-step jaunt from the arena), and at 5, the Astros head to their lockers to get in their game uniforms and grab a quick bite before heading back to the field before first pitch at 7. The average Minor League game runs three hours — so it’s usually 10 p.m. when the team heads back to the lockers and maybe 10:30 or 11 before they’re heading to their apartments (some shared with four other guys) for food, sleep and no time for anything else. For players like Franklin Perez, Carlos Sierra, Hector Perez and Yoanys Quiala, Minor League Baseball is as much about adapting to the United States and American culture as it is working on a split seam fastball or learning to hit a slider. Latino players make up about 27 to 30 percent of today’s professional baseball rosters, and many arrive in the rookie or Single-A leagues knowing very little to no English. Fourteen of the 32 players who make up the current Buies Creek roster are foreign-born young Latino men representing the Dominican Republic, Venezuela, Cuba, Panama and Mexico. D. Rich Hall with Campbell University foreign language adjunct professor Brian Thomas to not only learn the language, but American culture and important things like money management and social skills. 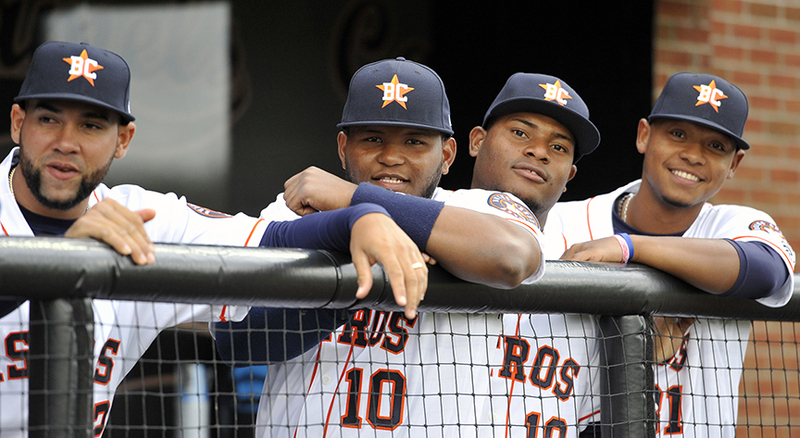 On this day, Thomas is joined by Doris Gonzalez, the organization’s coordinator of player acculturation and language development who has helped current Major League All-Stars like Houston Astros second baseman Jose Altuve of Venezuela and shortstop Carlos Correa of Puerto Rico during her career. Gonzalez routinely checks in on the programs at all levels of the Astros organization and has developed a close bond with many of her players, some of whom greet her with hugs and treat her like their mother. One particular class focuses on house problems — who to call when the electricity goes out, the toilet is clogged or the roof is leaking. Gonzalez and Thomas go over the English names for these repairmen — electrician, plumber and roofer — and get the players to stand in front of the class and perform mock phone calls in their best English. Some of the players zone out, no doubt the result of fatigue from the previous night’s game, a loss to the Salem Red Sox that went well beyond the typical 10 p.m. finish time. But most are happy to be doing this. Laughing as they learn. Taking notes. Three days earlier, they spent an hour at nearby Buies Creek Elementary School reading to kindergarteners and first graders, simultaneously sharpening their own skills and contributing to the community. Gonzalez says the biggest struggle for most incoming Latino players isn’t the language, but things like nutrition and housing. To help with housing, Gonzalez helps find host families in the areas surrounding the Astros’ Minor League teams across the country. She says the team in Buies Creek benefits from having a manager from Venezuela who speaks their language and understands their struggles. By the second verse, the players — each with a lyric sheet in both English and Spanish in front of them — are singing along. By the end, the song is echoing throughout the halls of the mostly empty D. Rich building, and Thomas is singing like the solo act in a concert hall. The end of the class, however, is bittersweet, as Gonzalez is heading to Florida the next day. She catches a few players at the door to congratulate them on their progress and assures them she’ll be checking in on them. 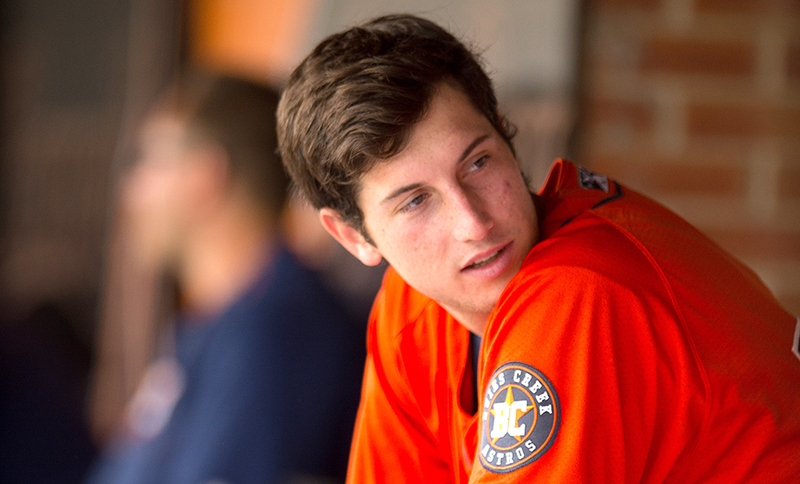 It’s Media Day at Jim Perry Stadium just before the season opener, and Kyle Tucker — a 20-year-old power-hitting lefty picked fifth overall by the Astros in the 2015 draft — is approached by a television reporter and cameraman from Raleigh. Already a millionaire (he received a $4 million signing bonus when drafted) and the No. 11 top prospect in the entire game according to Baseball America, Tucker is asked by the somewhat oblivious reporter if he’s excited to be playing in Fayetteville when the stadium opens in 2019. Tucker won’t be in Fayetteville in 2019. In fact, his time in Buies Creek only lasted eight weeks after he tore up Carolina League pitchers with a .554 slugging percentage, 9 home runs, 43 RBI and 13 stolen bases in just 177 at-bats. In late May, Tucker was called up to Double-A Corpus Christi, where he has 8 home runs and 20 RBI in his first 32 games. If all goes as planned, he’ll be in Houston in 2019, joining what’s currently the best team in baseball. Or, as happens with many top prospects in a winning organization, he may be trade bait for a team in need of a solid bat down the line. 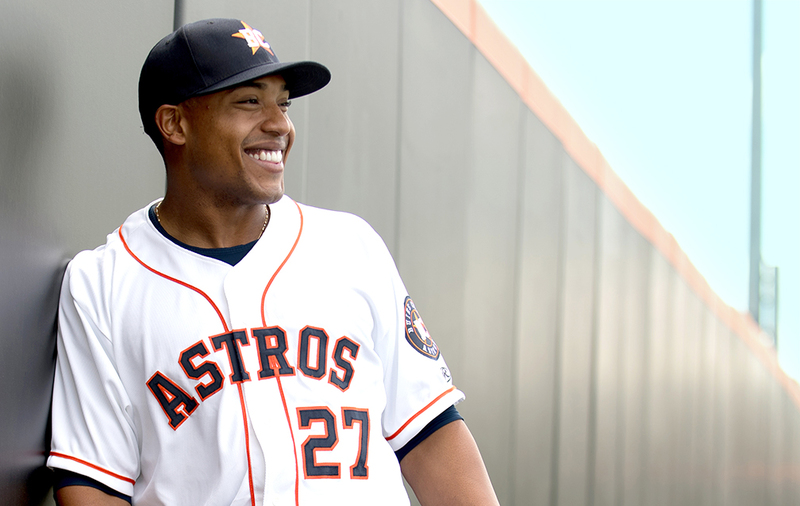 If Astros fans can claim anything when the team’s two years are up in Buies Creek, it’s that they saw good baseball played by some of the league’s top rising stars. Outfielder Jason Martin joined Tucker in Corpus Christi in May, but not before hitting three home runs in one game in a 12-6 win at Myrtle Beach on May 7. Opening Day starting pitcher Akeem Bostick needed just three starts in Buies Creek before getting the call to Double-A after going 2-1 with a 1.86 ERA. Yoanys Quiala went 5-1 with a 2.31 ERA in Buies Creek before his promotion, and Nick Hernandez pitched in 24 games as a reliever, earning 9 saves and 1.59 ERA. None remain. 11. Kyle Tucker, OF: Rated the No. 11 top prospect in all of baseball, the fifth-overall pick in the 2015 draft only lasted eight weeks before being called up to Double-A. His time in Buies Creek was memorable, though. Tucker hit 9 home runs and 43 RBI in just 46 games. 32. Franklin Perez, P: Perez threw five innings of one-hit baseball in his Buies Creek debut in April. As of this publication, he’s still in North Carolina, enjoying a solid season with an ERA under 3.00, a complete game, 53 strikeouts in 54 innings and just 16 walks. 58. Forrest Whitley, P: The No. 1 pick in 2016, Whitley doesn’t turn 20 until September. In his first two starts with Buies Creek, the Texas native gave up just one earned run and struck out 14 in 10 innings. As it typically happens to organizations with a strong farm system, Buies Creek hasn’t suffered too much from the losses. Hernandez, Franklin Perez and outfielder Myles Straw represented Buies Creek in the Carolina League All-Star game in June. And for each Corpus call-up, it seems another prospect is waiting in the wings. Catcher Jake Rogers, the Astros’ third-round pick in the 2016 draft, was promoted to Buies Creek on June 1 and hit 8 home runs in his first 40 games after the promotion. And then there’s 2016 first-round pick Forrest Whitley, a 19-year-old kid from San Antonio who received a $3 million signing bonus before ever suiting up. After striking out 67 batters in 46 innings in Iowa, Whitley threw five innings of no-hit, shutout ball in his Buies Creek debut, a 6-0 win over the Potomac Nationals. Buies Creek went 37-33 in the first half of the season, finishing six games behind Myrtle Beach in the Carolina League’s South Division. The Astros have run away with the second half of the season, however, holding the league’s top record and all but securing a spot in the league’s playoffs in September (the top teams in each division in the first and second half of the season advance). The winning has made the Buies Creek experience better for the players and the fans. But for Omar Lopez, winning is only a small part of his job as manager for an Advanced-A baseball team. More than anything, Lopez and his coaching staff are here to develop talent. That doesn’t mean Lopez disregards winning entirely. He just has a different way of phrasing it to his players. “Do we have to go out and win this game tonight? No,” he says. “But we have to go out and be winners. We have to fight for everything. Do our best every single. You do that and you put everything together, and the wins will come. And when you create a good atmosphere like that, it gets contagious. And you start picking up your teammates who aren’t doing as well, and that becomes teamwork. The first thing you notice at a Buies Creek Astros game is the lack of things to notice. This is a line from an April 7 article on baseball in Buies Creek published by Baseball America, which sent a writer to the season opener the night before. And it’s true. In addition to being the smallest stadium capacity-wise in Minor League Baseball, Jim Perry Stadium is also free of the mascots and between-inning gimmicks popular in most ballparks across the nation. For some, that’s part of the charm. Luke Erickson of Virginia attended his first Buies Creek game in May while vacationing in Emerald Isle (a good two hours away). Erickson says he’s been to 45 to 50 Minor League parks in his lifetime, and the surface at Jim Perry Stadium — artificial turf covering everything except the pitcher’s mound — was the first of its kind he’d ever seen. Fatbacks: Derived from the fat of pigs that is prevalent in Southern and French cuisine. Fatback is one of the delicious, delectable pork products that is the result of a hog roast that brings the community together, the release says. Fly Traps: Refers to the flytrap plant native to the wetlands of the Carolinas. It’s also a baseball term — the proper way to catch fly balls. Jumpers: A tribute to the 82nd Airborne, based at nearby Fort Bragg. Woodpeckers: A tribute to the endangered red cockaded woodpecker, which calls the longleaf pine in the area home. The Astros drew a crowd of 1,117 on Opening Day, but on some nights, there are as few as 200 people in the stands. Officially, the team has drawn an average crowd of 546 through its first 33 home games this year. That’s worst in the Carolina League by a good margin (next is Lynchburg, draws an average of 1,899 fans) and worst in all of Minor League Baseball (next is the Dunedin Blue Jays in Florida, who average 611 fans). But that’s OK with the Houston Astros and Buies Creek Astros GM David Lane. Five-hundred people in a small stadium feels different than 500 people in a park built for 5,000. Crowds at Buies Creek games are small and intimate, but they’re also loud at the right times and supportive. According to pitcher Justin Ferrell, small crowds have their benefits. One of the few people not in a uniform to attend every Buies Creek home game is Ricky Ray, Campbell University’s associate athletics director for external affairs and the community and media liaison for the club during its stay locally. Ray, who worked in a similar role for the Carolina Mudcats before coming to Campbell, says the attendance figures don’t tell the whole story when it comes to the community and its relationship with the team. “The community has really enjoyed having this team here,” Ray says. “Many in the area have opened their home to players and support the team at all times. The campus here has worked hard to integrate pro baseball as seamlessly as possible. And I think there will be a shared sense of pride as some of these players begin to make their way to the Majors in a couple of years.